By PALOMAT we offer technical support around the clock - 365 days a year. When you contact the service department, it is important that you have the PALOMAT serial number and type number ready. 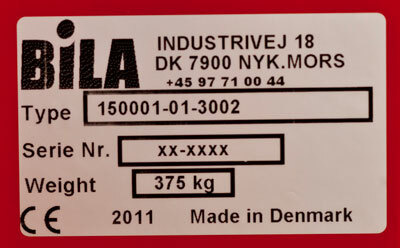 Marking as shown below is located on the side/ rear plate of the pallet magazine/ pallet dispenser. Technical support during the warranty period is free of charge, if you call during normal working hours. If you call the hot-line after normal working hours during the warranty period or after the warranty period has expired, you will be invoiced for the service you have received – the minimum payment is 1 hour. The warranty period on the PALOMAT is 1 year or 1800 working hours. Spare parts during the warranrt period are free of charge. The spare parts are invoiced by dispatch and credited when the defect spare parts are returned to us. +45-97 71 00 44 – push 1 for service.